As competition for people continues to grow, attracting and retaining the cream of the crop talent has become everything to employers and recruiters. Your businesses depend on the best talent to drive it to its full capability. A few weeks back at the Google I/O conference the company formally announced its AI-based job search engine ‘Google for Jobs’. Now, Google have just come out with a new tool specially designed to help small to medium-sized businesses recruit future talent. It’s simply called Hire and it makes it easy for recruiters to identify talent, build strong candidate relationships and efficiently manage the interview process from the beginning to the end. If you’re like me, and more than 3 million other businesses globally, you probably use the Google Suite (G Suite) for a wide plethora of things like Google Docs, Google Calendar and more. 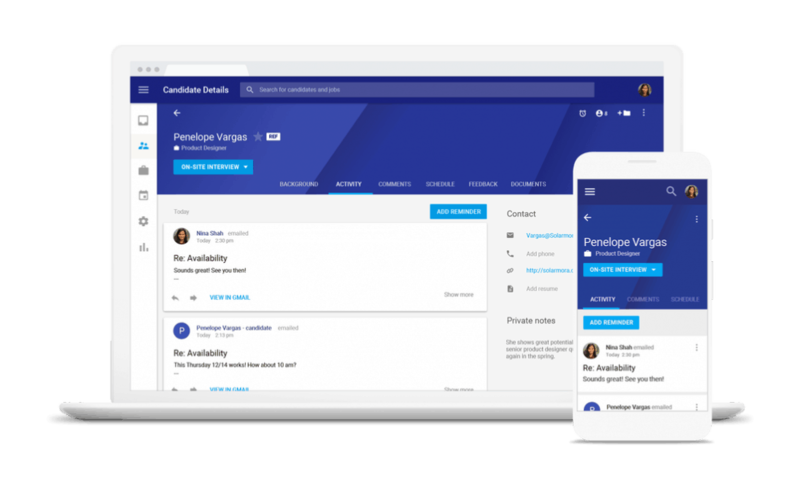 Google Hire integrates seamlessly into the G Suite, and is designed to make your hire process much more fruitful than it has ever been. For example, as an employer you could communicate with potential candidates in either Gmail or Hire, and your emails will sync automatically in both of them. You could schedule interviews in Hire with visibility into an interviewer’s schedule from Calendar with important information stored such as the candidate’s contact details, the full interview schedule and what key topics each interviewer should focus on. Instead of wasting time and creating a separate document with notes and details that might come up at specific stages of the interview, the Hire tool simply stores all your notes in one place and syncs everything together. As an employer, recruiter, or whoever you might be, you might have been using Taleo, LinkedIn, Indeed, Jobvite and more to do all of this. Well now you have Hire too, and it will definitely provide serious competition to those I’ve just listed. Google have, in conjunction with their announcement, said: “Hire addresses the needs of our G Suite customers—making it easier to hire the right people.” Everything is one place and the G Suite now looks even more enticing than it ever has been to businesses. It’s an integration that truly makes sense, and one that was long overdue in my opinion. Google is creating tools to help job seekers and now employers throughout the recruitment process and it’s great that small but growing organisations have these tools at their disposal. Even with these, recruitment can still take a lot of time and energy, which is why recruitment services such as those provided by Frank Recruitment Group will continue to exist. Hire is designed specifically for businesses with under 1,000 employees, of which we work with many. Ultimately, if it benefits the clients we work with, that’s got to be a positive thing. One of Google Hire’s concepts is to connect and nurture “silver medal” talent… to use them to either get to placement down the line, or for referrals to their friends. This is what agency recruiters should already be doing to keep their market share. I’m interested to see how the agency market reacts to this. Currently Hire is only available to United States based G Suite customers which have under 1,000 employees. However, if you’re not sure if the service is right for your company or you want to test out the product then you can request a request a demo by clicking on this link. With Hire, and Google for Jobs, Google have formally staked their place within both the employee and employer side of the recruitment industry. Let us know what you think about Google Hire, and whether or not you will be using it when it comes out internationally!